The Scottish Petanque Association and Inverleith Petanque Club hosted the 2016 Home Nations on 6th and 7th August. Teams from Scotland, England, Wales and, for the first time, Jersey competed for the trophy that has been won by England on each occasion since the competition was founded in 2000. England kept to their winning ways and pulled away from the pack from the first round. Jersey were lying in second after the first round, Wales 3rd and Scotland 4th. As the weekend wore on, England stretched their lead and won the Championships convincingly. It looked like they might record a record number of wins but they fell just short of the record with 80 in the end. 4 of their teams registered perfect 12 wins. Wales had a strong weekend, finishing with 48 wins and taking second place. Scotland, having been in 4th place for much of the competition, won some key games against Jersey in the penultimate round, meaning they secured third place on points difference. While Jersey finished 4th, they pushed Scotland all the way and only missed out on third by the smallest of margins. Congratulations to England for retaining the trophy once more. We look forward to seeing everyone next year. It is with a great deal of shock and sadness that we pay tribute to Pierre Bretenoux who passed away suddenly on Friday. Pierre was a Life Member of the SPA and, during his competitive days, won the Scottish Triples and Grand Prix Series both on five occasions, as well as a Scottish Doubles title. He represented Scotland on numerous occasions in the annual matches against the British Pétanque Association and the Celtic Challenge. While he stopped playing competitively some time ago, latterly he would often visit us at competitions to cheer on his son Paul and say hello to us all. Our thoughts are with his wife Carol, Paul and Cheryl and all his friends at the Birds and Bees at this very sad time. I would like to thank both you and Colin Montgomery for coming to Moffat on Saturday to teach the members of Moffat Pétanque Club the elementary techniques of playing. All eighteen members who were there said how useful the morning had been and how grateful they are to you for giving up so much time for them. You have left us with a lot to practise but also with some ways of improving our ability and ways to work on our techniques. Once we have had some time to work on your advice perhaps we might invite you to return to see what progress we have made, perhaps with a friendly game to sharpen the concentration! Should any other new club be hesitating to seek your help, I would suggest they swallow their pride and take advantage of this excellent service the Scottish Pétanque Association provides. In return, the two Colins would like to thank Moffat for their hard work, they really have ‘hit the ground running’ and we are delighted with the progress they have made in such a short time. We wish them every success and the SPA will always be on hand to assist. And a very big thank you to the Moffat PC Committee members who treated us both to delicious lunch. A reminder to all clubs, if you have some new members who could do with some coaching, or if you are an old hand but have fallen into some bad habits (!) or want to improve the SPA can help. We offer sessions to anyone who wants them. If you are interested please get in touch and we’ll send a coach or two to help you. 11 teams contested the annual SPA Triples Championship at Inverleith PC on Sunday 17 July. The weather forecast threatened rain but thankfully it remained dry, if slightly chilly all day. Many thanks to Inverleith PC for hosting. The competition was dominated by Triaxle (Paul, Kevin and Emma) who played some fantastic petanque at times. The finished with a perfect six wins and were very worthy champions. 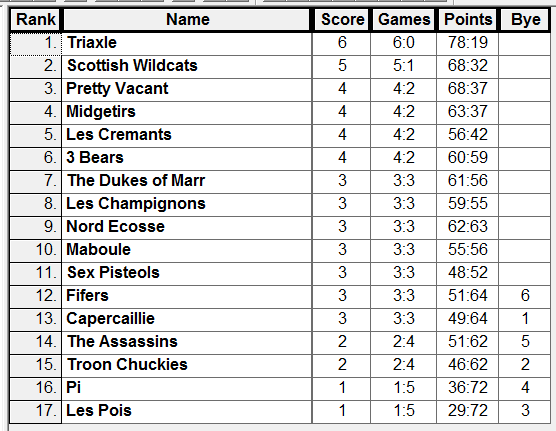 Les Champignons (Matt, Mags and Monty) also had a good day and finished in second place with 4 wins + 33 points. 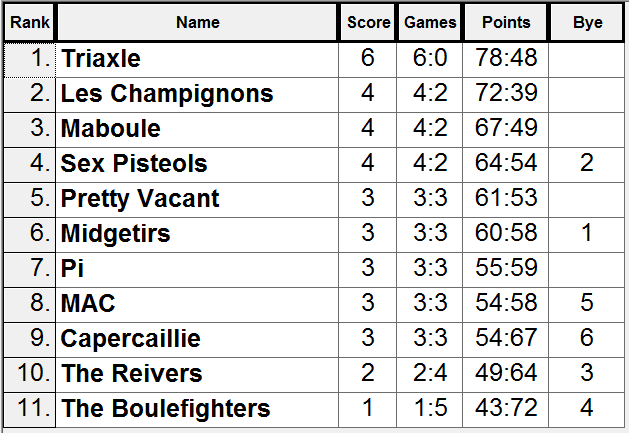 Maboule (Zandra, Dani, Bob and Doug) ran Les Champignons close, but finished in third place with 4 wins + 28 points. The next SPA event is the Singles, Doubles and Shooting in August in Fochabers. But before then, the SPA and Inverleith PC host the Home Nations Championship on 6 and 7 August. We’d encourage anyone who is in Edinburgh that weekend to come along to support the Scotland Team as we take on England, Wales and Jersey. The SPA is delighted to welcome two new petanque clubs in 2016. Melrose PC are based at Kingsknowe Hotel, between Galashiels and Melrose in the Scottish Borders. Moffat PC are based in Station Park in Moffat, Dumfries & Galloway. This brings the total number of SPA affiliated clubs to 11 and it is very encouraging to know that petanque is finding its way into new areas. We wish both clubs every success and we look forward to being of assistance to them where ever we can. A very healthy turnout of 18 teams (61 players) contested the final Grand Prix of the season at Troon PC on Sunday 19th June. For many this was the first opportunity to visit Troon after their refurbishment and what a great job Marr Rugby have done in restoring their clubhouse after their devastating fire 2 years ago. We hope Marr Rugby and Troon PC get many many years of enjoyment from it. The format was the usual Swiss Ladder system with timed games. 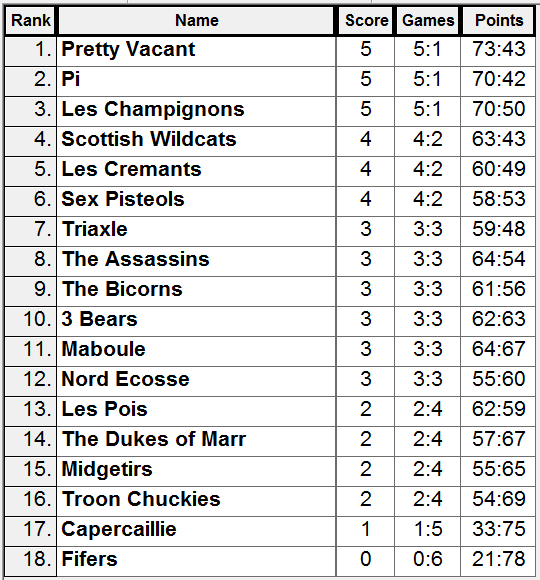 After 3 rounds, 3 teams managed a perfect 3 wins, with The Bicorns lying in 1st, Pi in 2nd and Les Champignons in 3rd. With a number of teams on 2 wins it was anyone’s competition at this point. The afternoon saw heavy rain fall constantly, meaning we were all soaked. We blame Shirley who said only the day before ‘it never rains in Troon’. But play continued as the pistes remained soggy by playable. After the final 3 rounds, Pretty Vacant (Lynn, Shirley and Richard) emerged victorious, taking not only GP3 but the GP Series win too. Pi (Carol, Paul and Peter) finished in second place and also qualified for the Home Nations, a great feat in their first year playing as a team. Third were Scottish Wildcats (Art, John and John), who also secured third place in the GP Series. 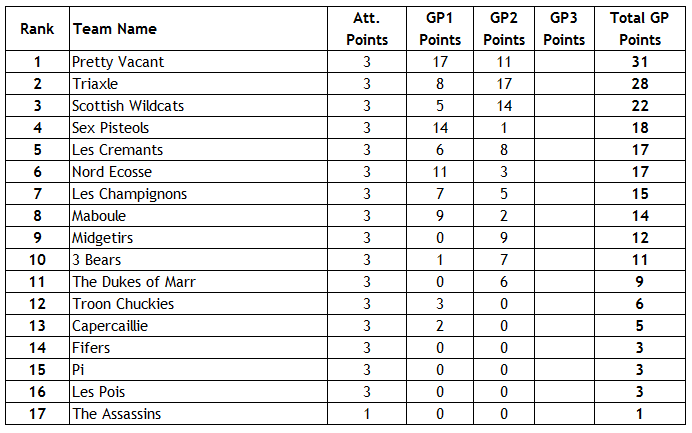 The final standings for the GP Series are as follows. Please note, 2 scoring errors were identified following announcement of the final placings on Sunday. 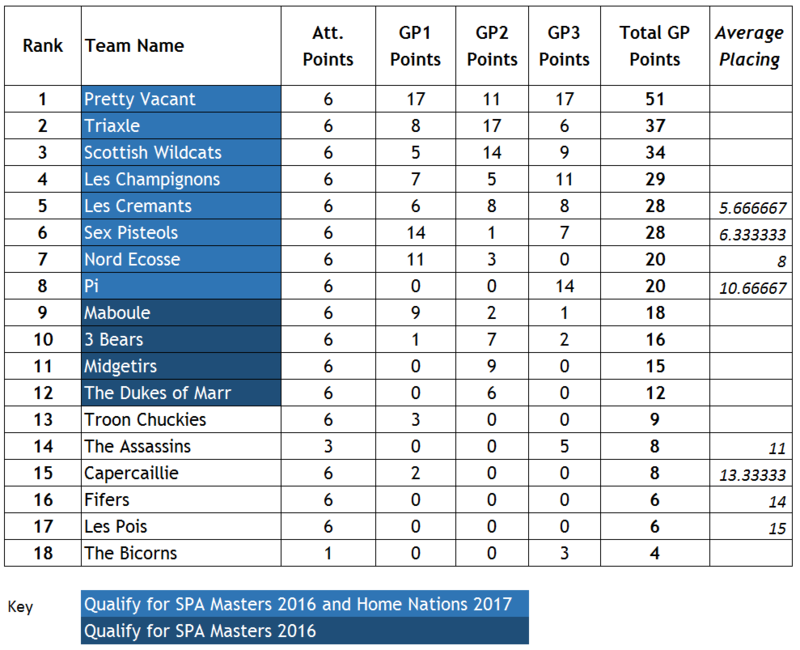 Those teams who were announced as qualifying for the Home Nations 2017 and SPA Masters have not changed, but the scoring errors have changed some positions. Please accept the scorer’s apologies! Note that where teams are tied on GP Points , the average GP position is used to separate them. Congratulations to all the qualifiers and commiserations to those who miss out this time. Saturday 18 June: Ayrshire Open (Triples) – £3 per adult player – free for school age youngsters. Register 1.30 for 2.00 start. On Sunday 5th June, Penicuik PC hosted the Qualifier to determine the Scotland players for the World Singles, Doubles and Mixed Doubles Championship to be held in Gent, Belgium in April. Four teams of four (2 women and 2 men) entered. The format was an unusual one – a trial for the SPA. In the morning all the singles players played against their respective singles opponents in round robins, while at the same time the mixed doubles round robin was played. In the afternoon, players switched into women’s and men’s doubles pairings for more round robins. Cumulative scores over the whole day would determine the winners. Grand Prix 2 was contested by 17 triples teams on Sunday 15 May at Perth Petanque Club. The usual format (6 rounds of swiss ladder timed games) meant that, due to the odd number of teams, byes would be necessary. The competition was dominated by Triaxle (Emma Montgomery, Paul Fletcher and Kevin Johnstone) who swept away all in their path to win with a perfect 6 wins, dropping only 19 points all day. Scottish Wildcats (Art Ager, John Taylor and John Dryburgh also had an exceptional day, winning 5 games and beating some strong teams on the way to second place. Third place went to Pretty Vacant (Lynn Jenkins, Shirley Legge and Richard Carter) with 4 wins. The SPA would like to thank Perth Petanque Club for their hospitality and hard work. Grand Prix 3 will be held at Troon Petanque Club on 19 June.